Nate used Photoshop to enlarge an image of Wolverine’s claws from the X-Men movie that he had downloaded. This allowed him to print out the image until it fit exactly onto the 1″ x 1/8″ Aluminum Flat Bar that he had purchased for creating the claws. Once the basic shape was on paper, Nate traced around it onto a piece of wood that he had cut to 1″ x 13″, which was the calculated maximum length of the claws. This length was determined to be the longest length that could fit on the back of Nate’s forearm. Once the wood had been traced, Nate gathered up his aluminum and headed to his Grandfather’s barn, where he cut the wood out on a band saw, sanded it on a vertical standing belt sander, and used it to trace out the aluminum claws. The aluminum claws were then cut out VERY CAREFULLY on the band saw and sanded lightly on the belt sander. 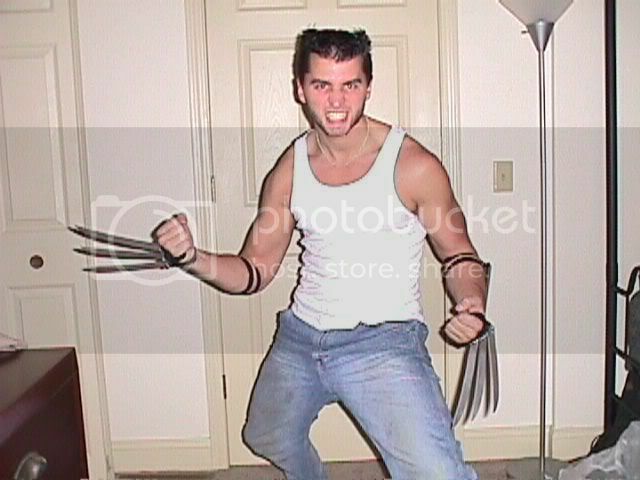 The next step was to put each claw under the wire brush wheel to give them a “brushed aluminum” finish, which Nate determined would look closest to “adamantium”, which Wolverine’s claws are actually made out of. The next step was to mount the claws to a ball-bearing track that could be hooked to the back of Nate’s forearm. The track was created from a sliding keyboard tray. The slider on the track was modified to be much shorter, and use only 8 ball bearings. Bolts were put through the slider on the track and then some galvanized metal was bent and hack-sawed to make the right shape for attaching the first claw. This required drilling holes through each galvanized metal pience and matching holes in the first claw. Once the first claw was fitted to the track, 2 other claws were then drilled to match the first, and 3″ and 3.5″ bolts were used with nuts, split washers, washers, and locking nuts to to space the claws apart and keep them tightly affixed to each other and subsequently to the track. Once this was complete, screws were added through the bottom of the track so that the slider could not slide out of the track (to avoid killing innocent bystanders). Pictured above the the fully extended claws on the track. 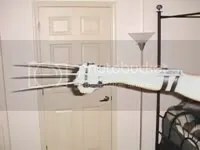 The next step was to create a way to attach the tracks to Nate’s arms. …and Nate thought growing facial hair was hard! The eventual solution was to cut fabric left over from creating the pads for the X-Men suit into harnesses for the claws. The piece under Nate’s wrist buttons into place so that the claw tracks can be held VERY tight, but still be possible to put on. The fabric was sewn to the tracks through holes that Nate drilled in key locations. Who’s got claws? Oh yea, that’s right… NATE’S GOT CLAWS! Yep, those are definitely claws! …on sliding tracks, nonetheless! 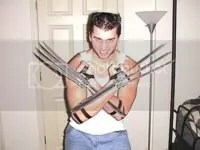 The above text and images were reproduced from Nates Wolverine Halloween Costume page at http://www.muc.muohio.edu/~natedogg/main.htm. Unfortunately the site is no longer accessible, so I have reproduced some of the more salient information from the site here. All of the reproduced images and text still remain the property of it’s owner, presumably, Nate. Enjoy!